Why is it that when the market drops 50% the guideline of "buy low and sell high" is ignored? It is a great time to buy equities. Because the OP is discussing people taking money out of the market or stopping new equity investments in anticipation of the possibility of the scenario not what to do if the scenario actually happens. Because people become fearful and don’t necessarily act rationally. People are even fearful now, in this ongoing long term bull market. That's true, though people sell on a rational basis as well. They might actually need the money to live because the situation is worse than they imagined, whether primarily due to the market's fall or the direness of their personal situation. 50% market drops are usually associated with some significant problems in the real economy, not just random market fluctuation. Therefore when the markets are down 50%, many people may be unemployed, or their jobs may be at risk, or they may be working reduced hours or at reduced pay, or they may be helping out family members who are experiencing these issues. Therefore their ability to buy into the markets during these periods is reduced. Which of course creates all the better buying opportunity for those that are in a good enough position to invest.
" 50% market drops are usually associated with some significant problems in the real economy, not just random market fluctuation. " Besides buying into 50% discounted stocks with new $, one can rebalance AA by selling the higher asset (bonds) to buy low asset (stocks) to get AA back to target. Definitely, if one has bonds to sell, one should definitely do that to buy more equities when equities are down 50%. I'm 100% with you there. Everyone is there until it happens and their balances have dropped and no one knows where the bottom is. That would be the ideal time to invest. But if you were retired with 25x expenses and an AA 50/50 you now have 18.75x so where is the money to invest going to come from? Perhaps you should read the OP and the responses before coming to your conclusion. What do you think is the answer to your question? My answer is of course not, as long as you believe stocks will recover within some reasonable amount of time and you have allocated fixed income assets to cover your needs in case of such an occurrence then a potential temporary short term setback is no reason to avoid a long term investment opportunity. Mainly because, what are your other options? Bonds have risks as well. What if inflation goes to 10%-15% and stays there for 20-30 years? And what if interest rates fail to increase? Bonds could lose 50% of their value in a very short period of time. If the disaster scenario for investing in stocks they drop 50% the day after you invest and don't recover for 3-5 years is that really a reason to be going to cash or avoid putting new money into equities? Or do people have an even more dire scenario in mind? The Japanese Nikkei index hit its all-time high on December 29, 1989 when it closed at 38,915. Subsequently, it closed at 7,054 on March 10, 2009 (82% below its peak twenty years earlier). I think something like that would be a disaster scenario for most investors, even Bogleheads. I'm not saying something like this will happen, nor do I want it to happen. But it did happen in Japan. In these discussions I think context is important. The CAPE ratio for Japan was north of 90 in 1989, the S&P 500 is 31 right now. If we got a 80% correction at a cape ratio of 31, (barring nuclear war) I’m selling everything I own, getting a personal loan, maxing my CCs for cash, buying VTI, getting a second job and going 100% equities. I’ll then come back on the forum and post pics of my New Yacht a few years now later. That’s assuming the fire sale would lasted for longer than 2 days. Context matters. If CAPE was 90, right now I suspect not many 80/20 or 90/10 folks would be “staying the course”... I’d wonder if even Bogle himself would recommend it at those levels. I would be less concerned about my portfolio and more concerned about the event that caused a 1-day 50% decline in stocks. That said, ignoring the underlying mechanisms prompting the extreme market action, what's the difference between and 1-day decline and 3-5 year recovery vice a 1-year decline of equal magnitude followed by a 3-5 year recovery, say like what happened in the Great Recession? If I'm lucky I'll live long enough to see this later scenario happen once or twice again. Would the Boglehead advice be to put X% of your money into stocks and 100-X% into bonds, so when stocks swoon you rebalance and money flows from bonds into the low priced stocks? I'm kind of new to the Boglehead forum, but it seems that X is usually between 40 and 60. After reading the forum for a few months I'm now a happy disciple! I think it's a case to hold a diversified portfolio and to not assume undue risks in the pursuit of returns. I do think that the average investor these days has grown complacent and is unwittingly assuming risk beyond their true risk tolerance. If somebodies risk matches their risk tolerance then they by very definition have no issues investing fresh capitol or being tempted to go to cash. I think the problem lies that most people in actuality are more conservative than they think they are. If someone is stressing about what the market is doing, or might do, then that's a clear sign that the risk they are assuming is not aligned with their risk tolerance. You can't know if you will have enough at the time. Things change. Your personal situation changes. The world changes. What may seem like a short-term setback now may seem like a permanently altered state later. And what it seems may be so. What you believe now may not be what you believe later, with good reason. Unless you're quite wealthy, in order to benefit materially from the good times, you have to be willing to suffer during the bad times, and be willing to never get it back. Ok, so what is your answer to the question then? If the disaster scenario for investing in stocks they drop 50% the day after you invest and don't recover for 3-5 years is that really a reason to be going to cash or avoid putting new money into equities? A black swan is by definition something you won't see coming. Now the last black swan was particularly black and swanny, but there was massive and swift action by the government to contain and limit the damage. I'm not certain that massive is a sufficiently intense word. So we had a nice snappy recovery after the gut-wrenching drawdown. A few years and it was like nothing happened if you had the ability and the will to stay invested. But a decade later we haven't even unwound the government intervention in capital markets. Some central banks are still intervening. What will happen after the next black swan? No idea. But things can get much worse than a 50% drawdown followed by a nice snappy recovery. And I think investors need to understand they are taking that risk. That's what the 100%+ gains you can also get are compensating you for. If investors need to have a more conservative allocation to sleep at night or to meet their goals, I won't fault them for it. The disaster scenario is far worse, as I think others have pointed out. The disaster scenario is they drop 50% (or more) and don't recover before you need the money. There is no answer. There always is the chance that will happen. You have to judge for yourself if that's a risk you're willing to take. I'm willing to take that risk right now. My willingness involves both my personal situation and the way I perceive the state of the world today. Not that I'm 100% stocks. I think that's foolish. As for "new money" vs. existing holdings, except for tax purposes, how long you've had the money is not important. So instead of answering the question ask you just construct another question with no answer. Probably the reason I don't plan for end of world scenarios, they are almost impossible to truly defend against and you sacrifice success with the most likely outcomes. Not sure how you advice benefits others but I can understand your need to express your doubts. At least many of the most active ones seem supremely so, even though John Bogle's guidance is based on optimism about the future. I'm confused by your reply. I expressed disagreement with one of your assertions because the data does not support it. (Far worse things have happened.) I did not construct a new question--I modified your question with the question I think you ought to be asking. I then provided an answer to that question as best as I think it can be answered. I did not intend to express doubt, only reality. Like I said I prefer to focus on more likely and manageable scenarios. Perhaps you should start a thread discussing how to deal with some of the less likely and more severe possibilities. I'm not trying to start a new topic. You framed the question by saying "disaster scenario." You even asked in the OP if people had a more dire scenario in mind. That is what I replied to. The disaster scenario only has to be a disaster for you to be a disaster scenario. It can't be quantified just by how many times the market has dropped by X%. I'm getting the feeling you have a particular response you would like to hear. But, let's take everything you said at face value for a moment. IF stocks might drop only 50% and recover in 3-5 years and you wouldn't need the money in that time period, I certainly think you still should invest in stocks. The real problem is that you don't know those things, but if you want to assume they are certainties, or have a high likelihood of being THE disaster scenario, and you're willing to deal with the consequences of being wrong, then of course I would proceed as normal. Agree. Many active Bogleheads continually bring up the idea of investing against Black Swan events... the entire world's economy becoming like 90s Japan, Czarist Russia, the Roman Empire, etc. Investing is all about psychology and probabilities. I can control my psychology. I mitigate probabilities choosing an appropriate AA and investing in the world. I'm optimistic and don't worry about Black Swan events. If the world collapses, I have much more to worry about than my money. Edited to add: Being optimistic is an valuable attribute in order to "stay the course". A bit of revisionism here. It's clear Japan's economy has not done too badly since 1990. Per capita GDP has risen at about the same rate as the USA. What's different is that the USA has a rising population, Japan has a falling one. Japanese financial markets have done very badly. Japan? Not at all badly given the headwinds that it faced - collapse of an asset bubble, aging population etc. Fukushima Daichi was another body blow, of course (but the economy will be stimulated for literally decades dealing with the aftermath & cleanup)*. But minds pay tricks. US GDP growth was greater in the 1970s than in the 1980s. However financial markets performed far, far worse (and inflation was generally higher). Thus, we tend to reverse that memory -- economic growth "must" have been higher in the 1980s. The problem is the extreme tail events are almost impossible to legislate for in a portfolio. It's almost statistically certain we will have another pandemic like the 1919-20 flu, which killed probably more than 1% of world population at that time (numbers of 20-50 million worldwide I believe are mooted). But how do you hedge that? * the fragility of life on the Home Islands, where the Earth just moves and wipes away human endeavours must, I think, contribute to that Japanese conservatism and pessimism. The Japanese know that whatever they build, some day the ground will always shake, and the sea will come for them. "Men make plans. God laughs". If are 50/50 and this drop lasts 3-5 years as you indicated, the money to invest in equities is going to come from the sale of bonds when you rebalance, probably I'm guessing 3-5 times throughout that lull in the market. As a side note, people seem to forget that SWR (you said 25x expenses so I'm guessing this plays into your scenario) is based on running simulations that include the worst case scenarios and huge drops in portfolio value. Having your portfolio drop such that you are now drawing from 18.75x expenses or less for a few years might make you rethink buying a new car or going on vacation that year, but historically there were many 30 year time periods when someone could start out with a 6% withdrawal rate (only 16.6x expenses), adjusted upward each year for inflation, and still had money left over at the end of the period. The 'S' stands for 'Safe', and in your chosen scenario it still applies. Why wouldn't the OP simply use a rising equity glide path (starting at as little as 25/75 equity/fixed) if they're worried about such a scenario? Seems the above would work even if one is not at the point of retirement. The motivation for the OP was the number of threads appearing suggesting reducing equities or not buying additional equities because of concerns with current market valuations. Essential people were suggesting that current valuation were reason enough to act. Sounds a bunch like California. Being optimistic is antithetical to thinking in terms of probabilities. Optimism introduces additional biases to reality. The same can be said of pessimism. By taking a pessimistic or optimistic approach, one is deliberately avoiding reality, as far as we can know it. In the case of pessimism, if one assumes the worst is likely to happen, they might take what they think is an overly conservative approach. This might simply result in working longer or having quite enough but less than they could have. In a worse instance, they might simply be trading risks, excessively focusing on one risk while unaware they are taking on more of some other risk. If one assumes an optimistic outcome, they might take on too much risk. In less extreme cases, they might capitulate out of necessity or because they cannot stand it psychologically, and only suffer a poor outcome--maybe temporary, maybe permanent--rather than a catastrophic one. In extreme cases, they can be wiped out entirely. If you thought in terms of probabilities, you would realize there is a wide range of possible outcomes between "everything's fine" and "world collapses." Investing is both reality and psychology. I'm fully aware of the range of possibilities. Investing is a means to an end. Equity investing is geared to taking more risk to get a higher reward to reach that goal. So, the allocation to equities should have something to do with the need to reach your goal, your age, and your potential drawdown percentage. In or near retirement and have reached your goal you probably should have a target portfolio balance that you don't want to go below. If possible, that balance should be low risk which usually means fixed income. Some seem satisfied with say 4 or 5 years worth of drawdown in fixed income. I think the test is what does your portfolio look like in retirement if the equities drop 50%, stay down at that level for 5 years and you withdraw only from fixed income to support your expenses. If the result is you are in decent shape that is a good sign. One caution is that when there is such a severe and prolonged drop there is often other bad side effects. e.g. job loss, retiree health insurance cancelled, pension changes, company failures, home values drop/sales take longer, etc. I basically follow Dr. Bernstein's idea of having enough "safe" fixed income to fund my withdrawal needs to age 90 (19 years). If I had fewer assets I might lower the number of "safe" years and try to keep my equity allocation at least at 40%. In general, if you have reached your number in retirement, you don't usually need a very high equity allocation. The real challenge is being in retirement and not having reached your number. If there is a really bad equity market and slow recovery you may be in retirement earlier than you plan. Happened to me in 2008. Sounds to me like you need to revisit your investment policy statement and re-evaluate the amount of risk you are taking in your portfolio. Perhaps you need to de-risk a bit here. It is never a good idea to base an investment strategy upon disaster scenarios. Since the early 1980's I have come across dire predictions about the death of the US Dollar, Stock Market crashes, and the next Great Depression. I ignored those predictions and invested anyways. Markets are always risky. Since 1946 (Post WW2) out of a total of 26 bull/bear cycles there have been only 2 bear markets (1973-74, 2007-08) that have dipped over 50% so they are exceptionally rare. 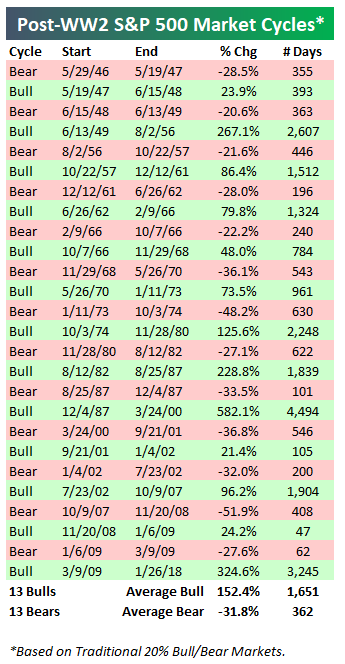 During the same timeframe there have been only 6 bear markets that have dipped over 30% so even those are quite uncommon. The longest bear market lasted 630 days, just under 2 years. Your starting this thread tells me that in the back of your mind that you are worried that the markets are due for a big tumble, which might upset your financial goals in retirement. I remember how you agonized over whether or not to retire and then agonizing whether or not you had enough money to retire. It just seems that something is rumbling down there in your gut. It seems that something you are doing is making you uncomfortable, hence my comments that you should revisit your Investment Policy Statement. I don't know, perhaps you are just by nature a worry wart. If you are nervous, perhaps you need to cut your risk profile, more bonds and less stocks. I am also cautioning that the doomsayers are always out there. I mostly have tuned those people out but am mindful that markets are risky. I have lived through the October 1987 crash, the 2000-2002 bear market, and the 2008-2009 financial crisis and bear market. So I have experienced bad things happening to a good portfolio. I have felt the pain of loss. I thought my comments were pretty clear. Down deep you are concerned about something. It is a good time when markets are near all-time highs to revisit your IPS and the risks you are taking with your portfolio. Better to panic at market highs rather than after everything has crashed.